Ladies and gentlemen, we hope you've enjoyed our visits to Serial Experiments Lain and Fruits Basket. Our next stop on the tour will be Neon Genesis Evangelion. On your left, you'll see Takato Matsuki reaching a 400% synchronization ratio with Guilmon. No flash photography please. Usually people don't start making the Evangelion connections until D-Reaper and its “agents” start showing up, but this is the point where the parallels begin to crystallize. Something terrible happens to the main character's friend, main character gets pissed off and loses the keys to the car, then turns around and gets his mojo back, merging completely with the beast rather than simply controlling it. It's as crazy here as it was in Eva, which is saying something. This is one of the more dramatic cases of breaking down everything to permit further evolution, but it is not the only one. In fact, with the exception of Davis, it happens to every single goggle boy. Sometimes it involves the death of a Digimon, sometimes it involves a trip to the real world... sometimes it takes one annoying electric fence. Every time, the boy gets off the mat and comes out swinging. None of the other goggle boys had to deal with Megidramon, however. This monstrosity makes Skullgreymon look like Cubone. Kill Beelzemon? This guy's close to eating Beelzemon. Not only are all the kids horrified, but so is Hypnos as Megidramon carries so much energy the world starts to collapse on itself. Isn't that why Calumon was sent out of the Digital World to begin with? Some good that did. So how can it get worse? Simple- Beelzemon decides to rise to the occasion. First he kills and absorbs Makuramon, then uses the monkey's attack to trap Rapidmon and Taomon. The only way out, apparently, is for Henry and Rika to swipe cards freeing Terriermon and Renamon but conceding their Ultimates' energy to Beelzemon. Given the implications of that, you'd think Rika would have protested this decision a little more. This puts Beelzemon over the top, with a surplus of power but difficulty controlling it. It's sure enough to take out Megidramon though! While Rika and Henry do that, once again, Kazu and Kenta seem to be the only ones focused on Jeri's well-being. Takato tries, but Jeri's not having it, upset at what Takato had done to Guilmon. 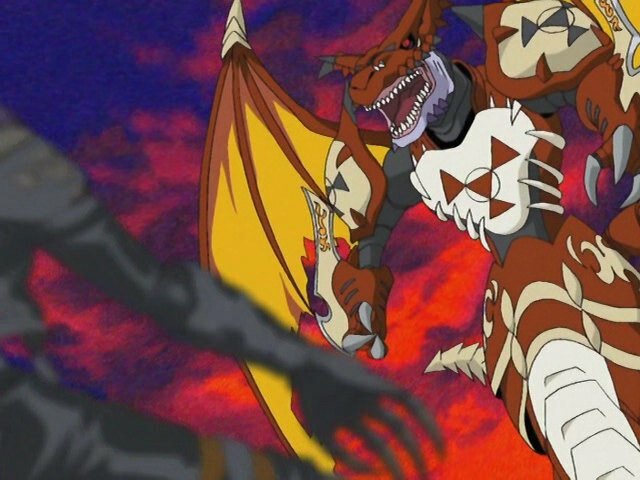 Devastating as Leomon's death was, Megidramon has to be equally responsible for her trauma. This is where that affection Jeri's shown towards Takato hits home as it's the ultimate “you think you know a guy” situation. The kind of energy Takato invested into this monster didn't come from nowhere. It was buried deep down within him just as Jeri's demons were. 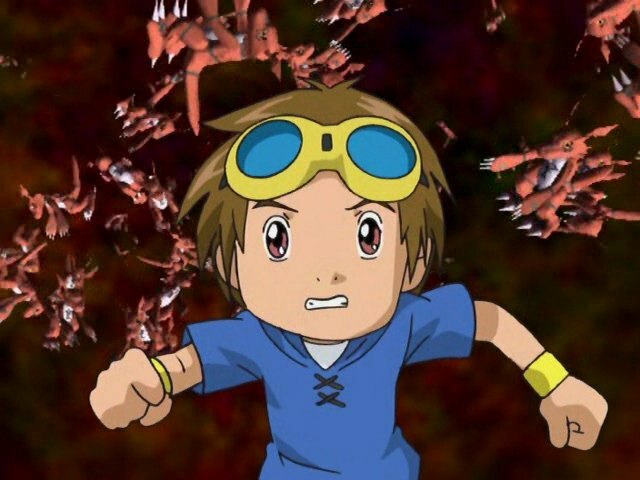 And it all comes out at once- this sweet kid becoming so unrecognizable and so horrible, then ordering his Digimon to do the same, all right after her own partner's death. It's three bombs dropping at once. 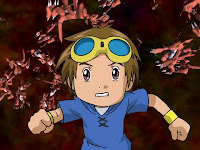 Takato realizes his mistake immediately, and approaches Megidramon after his defeat. He already knows what happened, and frames it correctly: he lost control of himself. A mistake this bad and this irreversible is always good for a trippy flashback sequence. Takato realizes that resetting isn't good enough, as it abandons his prior relationship and all the mistakes he's learned from. No, all he wants is the chance to learn from this one too. His lesson is that he's not just sending Guilmon off to fight his battles; they're in them together. The way to make it all better? Make that literal. Wow, out of nowhere, an intense argument between Janyuu and his wife. The rest of the family doesn't get much attention, but between Mayumi's yelling and Rinchei and Jaarin in the classic “kids watching through the doorway as mommy and daddy fight” shot, they made their presence felt. At one point, Beelzemon begins to wonder if this was all Chatsuramon's plan. If Chatsuramon actually was able to arrange for all that to happen, he's a bigger mastermind than Myotismon. Anybody else totally horrified by Rapidmon and Taomon's wings busting out of Beelzemon's back? Good, because you should be. Lost in all this is Rika accepting Suzie as a tamer like nothing. Had Rika even met Suzie before last episode? 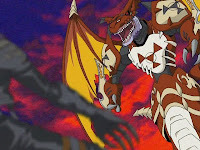 I always found Megidramon and Beelzemon's battle so... tame. Just some grappling and a few punches delivered by Beelzemon. Megidramon didn't even get a real hit in. And no mention of the scene where Guilmon randomly grows Megidramon's tail to smack away some of Beelzemon's bullets?